The island of Belitong, while officially part of the Sumatra, alienates itself due to its wealth. 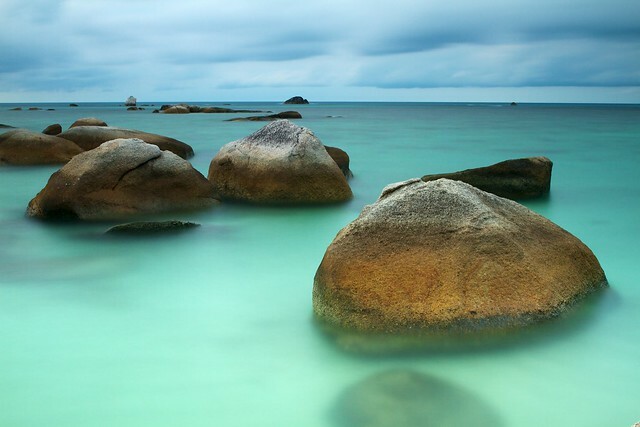 Up until the nineteenth century Belitong maintained a shadowy existence despite being in close proximity to major shipping routes through pirate coves littered around its coast and poor charts, making approach hazardous. However, tin deposits discovered on the nearby island of Bangka sparked interest in Belitong, and, in 1851, a party of explorers found deposits of tin (Heidhues 1991). Industrialization of the island commenced immediately. As the Company had no interest in hiring natives, Chinese labourers from Singapore were imported, and along with them came the religion of Islam. Once a tropical land littered with native villages, the landscape of Belitung had been transformed into a mining town. While the concept of family was not evident (no families resided on the island during Dutch occupation), the importance of community, a value prevalent in modern Indonesia, was found deep within the mines. The mines operated on a numpang system, a small cooperative work team that shared the profits made equally between them (Lindblad 1999), reminiscent of kampungs in Indonesia today. However, technological change and major cutbacks during the twentieth century reduced the importance of the numpang, with non-skilled labour being replaced by machinery (Heidhues 1991). The war in Asia had now reached in the Indies, and in 1942 Japanese troops had taken over the island. Tin mining was turned over to a Mitsubishi affiliate, yet it was only able to produce little amounts of tin before the destruction of Japanese shipping made further efforts useless. The end of the war was barely made public to the residents of Belitong, fear of unrest drove the commanding officer to keep the news of Indonesian independence secret until October 20, 1945, two months after the war. With only a handful Japanese soldiers left on the island, Belitong was passed back to Dutch control without an Indonesian merdeka. The natives of Belitong had not known freedom until the island was passed to the Indonesian sovereignty in 1949, where the Indonesian government took over the PN Timah company from the colonial Dutch, seizing their assets. < Previous Post B: Design Lead System Change – Down with the Refrigerator! Its really nice to read about something different. I would never have known about this otherwise. I also find it interesting how even though they were separated from the mainland and cut off from information, almost the exact same process of colonisation occurred there. I wonder if the rich are native muslim or if the wealth is held by foreign investment?